Are Mahler and Shostakovich so overwhelmingly popular because their symphonies deliver more bang for the audience's bucks? That outlandish proposition is worth serious consideration, because it is very relevant to classical music's commitment to broadening its audience. The concert hall is caught in a pincer movement. On the one hand the elusive new younger target audience is conditioned to bass heavy rock music heard on up-close-and-personal earbuds/headphones and sub-woofer reinforced home cinema systems. On the other hand, the dictates of authenticity mean orchestral sound, particularly in music from the classical and baroque periods, has become leaner; while at the same time concert halls have become bigger and less sonically intimate in response to commercial imperatives. This pincer movement means the new audience wants more bangs, but classical is delivering less bangs. The holy grail is a new younger audience, but that audience craves a more visceral sound. So a Haydn Symphony on period instruments in the Albert Hall fails to cut the mustard. But a full-on Mahler Second in the same hall does. Which may well be why so much Mahler is programmed these days. Now the purpose of this post is not to moan about the hegemony of Mahler, because that is self-evident. Instead, let's accept for the moment that new audiences want more bang for their bucks. Which means delivering more bangs is the right way forward, but inflicting death by Mahler on both new and old audiences is not. So the answer is very obvious. Give new audiences what they want in moderation; but be a lot more imaginative in choosing the bangs. If Mahler is the gold standard for today's audiences, surely Malcolm Arnold's Mahler-indebted symphonies should be the silver standard. And a revival in big band/big bang classical and baroque is also overdue. If Rodgers and Hammerstein can become a BBC Proms fixture, why not transcriptions of Bach by Stokowski and others? 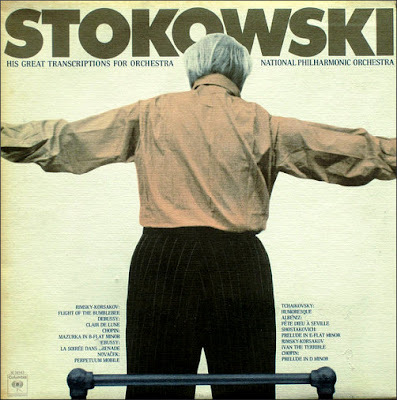 There is a rich vein of other transcriptions by Stoki to be mined, while legitimate arrangements such as Hamilton Harty's Handel suites would surely be new audience pleasers. Also long overdue is a return to big band Haydn and Mozart, as practised so sublimely by one of the greatest-ever Mahler interpreters Bruno Walter. 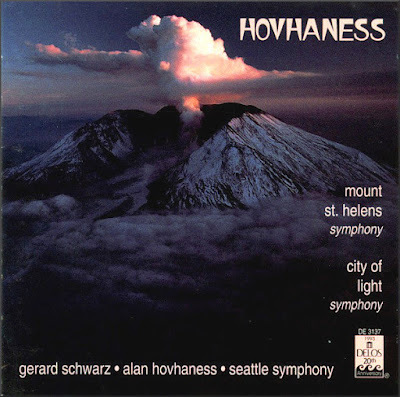 If Proms audiences want sonic fireworks, Alan Hovhaness' 'Mount St. Helens' Symphony can certainly deliver - the final movement 'Volcano' on the Delos CD seen above on which Gerard Schwarz conducts the Seattle Symphony has some of the most impressive bass ever captured on disc. Forget all those tired and irrelevant arguments as to whether Malcolm Arnold and Alan Hovhaness wrote masterpieces. They wrote excellent, honest and well-crafted music that speaks the same language as Mahler. For the purists, less Mahler and more Hovhaness may represent dumbing sideways. But if it connects with a wider audience, does that really matter? My thanks for inspiration go to music therapist Lyle Sanford and the link he sent me to the article Music is not for ears. Any copyrighted material is included as for critical analysis and will be removed at the request of copyright owner(s). Also on Facebook and Twitter. 'Hovhaness, Arnold, Nielsen...there's so much that can be filtered into the mix. Barely a decade into seriously engaging with classical music as an adult I cringe at yet another Mahler cycle. Even Sibelius, a reliable second order warhorse (in popularity terms not quality) seems rarer now? Sagacious observations here from Pliable and from the commentator above. Particularly Jayaprakash's comment concerning the development potential of audiences usually enamored of the more advanced genres of popular music. Something like would (I think) be an immediate hit if widely programmed. The audience would likely be an extension of that which patronizes showings of films like the Lord of the RIngs done with live orchestral accompaniment. It is undeniable that the modern aesthetic of audio engineering and personal listening is negatively affecting the reception and embrace of classical music. Let's take this into account - before it's too late. Thanks for the Harty/Handel Water Music tip! Never knew of it - would love to hear it live.